ALI Social Media Summit '08 Jun 9, Chicago | Andy Sernovitz | Damn, I Wish I'd Thought of That! ← Why did someone put this on the fridge? The rise of social media has made word of mouth one of the most important, most effective, and most ethical ways to promote your company. The rise in consumer control of the media, blogs, and social networks is changing advertising forever. These communications tools are equally as important  and effective  for internal communications, employee teams and building internal support. This session will focus on how this phenomenon has happened — and what we all need to do to keep it happening. 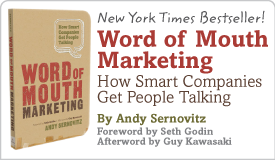 Learn how to make word of mouth part of your corporate philosophy and how to do it the right way. Become part of the movement and evangelize honest word of mouth. We all win when businesses learn that they make more money by earning the respect and recommendation of their customers.